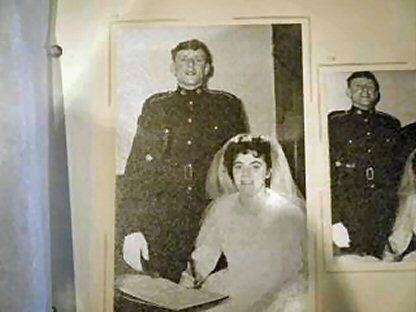 My sister Margaret 50 years ago on her wedding day and her handsome soldier! Didn't she look beautiful in that dress! It was 50 years ago today. The bride wore white. The groom was in the Cheshire Regiment and wore uniform. 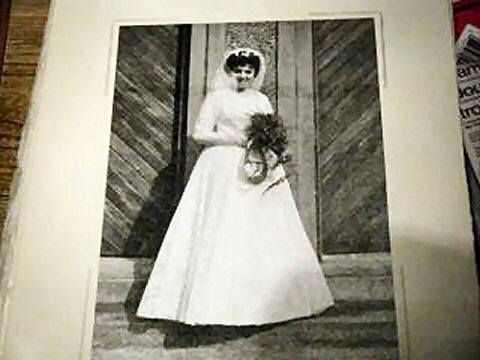 Margaret carried a white Bible that that day that I also carried on my wedding day and I still have it today. They had it initialed for me and gave it to me after the wedding. I don’t know why they gave it to me and not my sister Esme but they did! I remember the day quite well. It was all very exciting at 7 and the spring weather was less kind than this year. Anyway, it was a good day and the beginning of a good marriage.